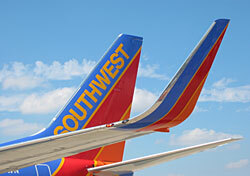 Southwest: Record Profits and Low Prices? The past week has seen a spate of quarterly earning reports from the airlines. For most carriers, the third quarter was a very good one indeed. Solid profits were the rule, with both American and Southwest reporting their highest-ever profits for the period. In American’s case, the strong financial performance is largely attributable to its reorganization in bankruptcy. The cost-cutting and operational streamlining have had their desired effect. At Southwest, on the other hand, it’s been business as usual. So how has the airline that aggressively self-promotes as a low-fare leader managed to squeeze extra profits from its operations? On the cost side, fuel costs were down 5.7 percent year-over-year. But any savings there were probably offset by the airline’s aircraft-replacement program, and by expenses related to the integration of AirTran. As for capacity, Southwest’s available seat miles are only up by 1 percent over last year’s third quarter. The difference-maker was the airline’s operating revenue per available seat mile, which increased 4.5 percent. In other words, that extra profit looks to be coming from higher airfares. All companies want to raise their prices; it’s in their DNA. But in doing so, they risk losing market share. And longer term, for a company that hangs its hat on low prices, higher prices can destabilize its very identity, weakening the branding that has made the company economically viable. Which brings us back to Southwest, and the legitimacy of its claims to be a low-price leader. A recent MIT study, “Evolving Trends of U.S. Domestic Airfares: the Impacts of Competition, Consolidation, and Low-Cost Carriers,” contends that “while a Southwest effect on average fares still exists at U.S. airports, it has diminished over time.” The study notes that, between 2007 and 2012, while average fares increased by 8.7 percent at large airports, and 11.9 percent at medium-sized airports, Southwest’s average fares were up around 25 percent. Southwest may still have the best fare on a particular route, on a given day. But it’s hardly a given. Travelers looking for the lowest price can no longer assume that they’ll find it on Southwest’s website. Is Southwest still your go-to airline for low fares? Are Coach Seats Getting Worse? You Bet!